I've got to say, I don't usually agree with much that's said on the Tory bench, but their supporters sometimes make a good point. The world is evolving faster than our parliament can handle,it seems. Lately theirs been a lot more criticism than usual (Spring election looming?) and it would seem both parties are bickering like an old married couple! 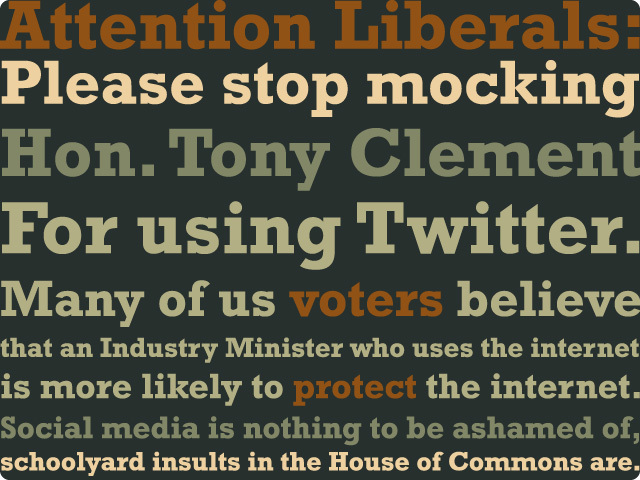 The Liberals are just grasping at straws and I for one think Tony should be using Twitter. He should have all the social networks at his fingertips... he is the Industry Minister, and if he's not up on the internet, then how is her going to help regulate it? I really think we need to oust the CEO of the CRTC for his comment "25 gig is plenty of internet access if you're not playing 3D games or streaming movies..." Anyone so out of touch needs to step down and realize he's just finished. But that's just my two cents. Here's to hoping this UBB goes away and the CRTC finds some competence in the near future.